I don't usually discuss pilot news, as there is a statistical chance we'll never see the product, so what's the good in getting excited over it? If it becomes a series, then sure, I'll up my bluster, but rarely before. I've been burned too many times before. But this time, I simply can't help but be excited. I'm physically incapable of not being so. 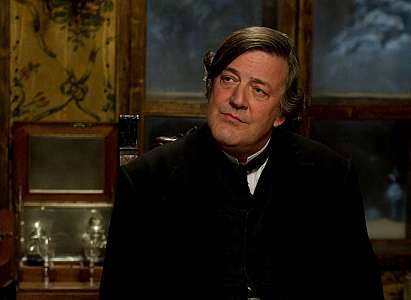 Stephen Fry is returning to TV. Sadly, it's American TV. And sadder still, it's network. But still, weekly Fry. What could be better? It's on a sitcom, starring former Ron Weasley Rupert Grint, about superheroes? From Michael Fresco, one of the minds behind Better Off Ted? Well... OK then. Fry has been cast as Randolph, butler and perpetual support to Grint's Clyde, a mild mannered modern youth who inherits a vast sum of money, and decides to become a super hero. Fry will be the "Alfred to Clyde's Batman" in the CBS pilot, Super Clyde, and there isn't a single thing about that last paragraph that doesn't make me all smiles. Fry is the perfect straight man, and mastered (hell, practically defined) the role of the butler in his former role in Wooster and Jeeves. He is the exemplar of the relevant irreverency that seems to come so easily to the British, and no one stone faces the sardonic put-down quite so well as Fry. CBS, please take this pilot to series. And do us all a favour, and make it a good one (hint: let Chuck Lorre no where near it). Also, would it kill you to get Hugh Laurie locked into a recurring role? I doubt it very much. In other pilot news, Karl Urban has joined J.J. Abrams' latest pilot. Bad Robot has fantastic luck getting pilots made, somewhere in the order of two or three since LOST premiered. They don't have a lot of luck getting them to series order, and no luck getting them to last beyond a season (Fringe is pretty much the only post-LOST example).One of their attempts this year called Human, which reads like an Asimov short story, is centred around a pair of detectives. One, now played by Urban (Abram's Star Trek, Dredd), is an LAPD officer "who has shut down emotionally after a tragic mission that claimed the lives of nine of his fellow elite officers and left him critically injured." The other, played by Michael Ealy, is a robot. Together, they fight crime. Also starring will be Lili Taylor, Minka Kelly, Mackenzie Crook, and Michael Irby, and it will be overseen and written by late-seasons Fringe showrunner J.H. Wyman. And now that I think about it, the plot also sounds a bit like Alien Nation. I like Urban. Really like. He's a strong actor, who obviously loves himself some genre. He tends towards making interesting career choices, so hopefully that's an indication that Human offers something more then just broad procedural concepts with genre tweaks. As is Bad Robot's usual modus operandi. Via The Mary Sue, and again.